These braised beef short ribs are so tender, fall off the bone and melt in your mouth delicious! Braised beef is the ultimate comfort food on a chilly day. You might also enjoy our original braised beef recipe or braised beef stew! The best way to cook short ribs is by browning them in oil on high heat and finishing the short ribs in the oven low and slow. This cooking method is also known as braising. Start off by cooking the chopped bacon in a dutch oven pot until the bacon is crispy and remove it. Now place the beef short ribs into the pot and brown each side and reserve for later. Then saute the onion and minced garlic and add the braised beef back in. Now you can add in the baby carrots, spices, and dried mushrooms (fresh will work as well). I like to roughly stir the ingredients with a wooden spoon before adding the red wine and chicken broth. Now place the pop lid on top and place the braised beef in the oven for 2.5 hours at 340 degrees Fahrenheit. To thicken the sauce of the braised beef short ribs I like to mix a little cornstarch and water and pour it into the braised beef, then cook for another 30 mins at the same temperature. Short ribs are a cut of beef taken from the shoulder of cattle. The most common way to identify short ribs is by looking for a chunk of meat that has a little blade of bone sticking out. The best way to prepare short ribs is by braising them. Braising is a cooking method commonly used in braised beef that involves browning meat in dry heat like oil, then cooking it in liquid over low heat and a longer period of time. You can even use this method with a slow cooker like my beef brisket sandwich, or beef stew. You can easily make crockpot short ribs using this recipe’s braising method. Simply brown the meat in a large skillet, then place all the ingredients including the braised beef in the crockpot. Cook on low for 6 to 8 hours or high for 3 to 5 hours. Any type of braised beef will pair well with pasta, mashed potatoes, or creamy polenta. For a low-carb alternative, pour the braised beef gravy over the meat along with a spinach pomegranate salad or some sort of sauteed vegetable like garlic asparagus. 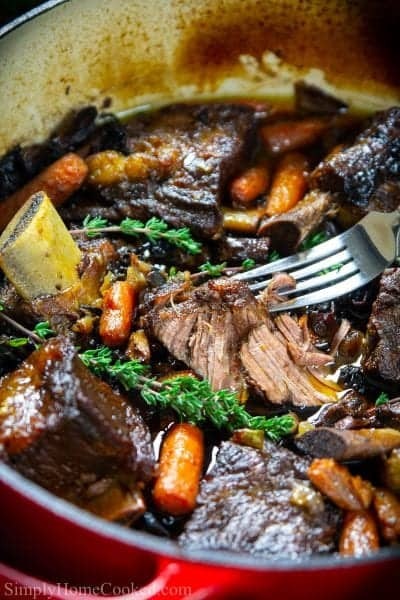 This braised beef short ribs recipe is fall off the bone, tender, and melt in your mouth delicious! In a Dutch oven pot, fry 4 strips of chopped bacon until crispy. Then remove. Bring the heat to high and brown each piece of short ribs in the pot. Add extra grease as needed. Olive oil works great. Once the meat is browned, remove and reserve for later. Add the chopped onion and garlic to the dutch oven pot and sauté for about 3-5 mins. Then add the braised beef back into the pot and add the baby carrots, dried mushrooms, cumin, paprika, salt, and pepper. Stir it to combine and then add the red wine and chicken broth. Cover the pot with a lid and braise in the oven for 2 1/2 hours at 340 degrees Fahrenheit. Now combine the cornstarch and water and pour it to it the braised beef. Stir it in with a spoon and cover and braise for another 30 minutes at 340 degrees Fahrenheit. If I didn’t want to do wine; do you have a recommendation on a substitute? What’s a good amount to pay for short ribs?? Thanks!! 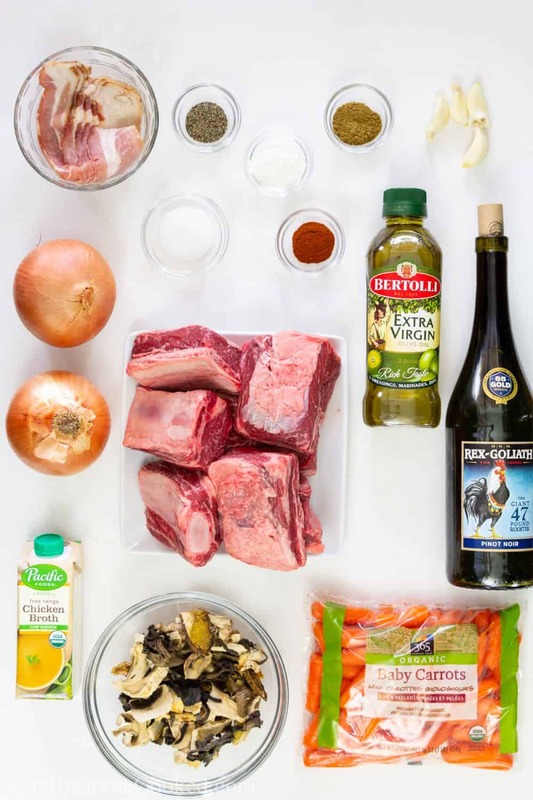 Hi Angie, you can substitute the red wine with more chicken broth or beef broth for this braised beef short ribs recipe. Also, it’s hard for me to determine the price of short ribs since every story can differ quite vastly. What did you do with the bacon? These short ribs look amazing and will be on my table soon!! I was kind of surprised to see you used chicken broth instead of beef broth when cooking these. Would beef broth overpower the dish? Hi Lisa, I actually just used whatever I had on hand. 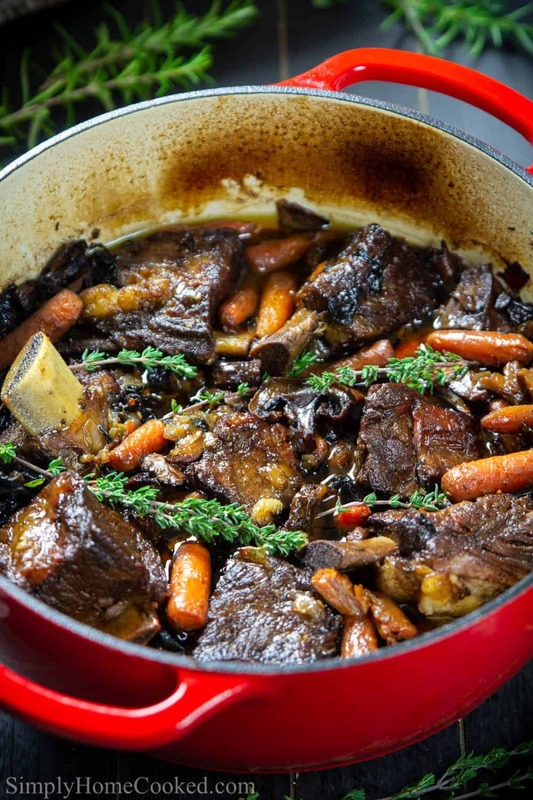 You are more than welcome to use beef broth or even vegetable broth for the braised beef short ribs. The beef broth shouldn’t overpower the dish at all. I hope you love it! These short ribs look absolutely mouthwatering. I need to make them asap! My whole family loves braised dishes! 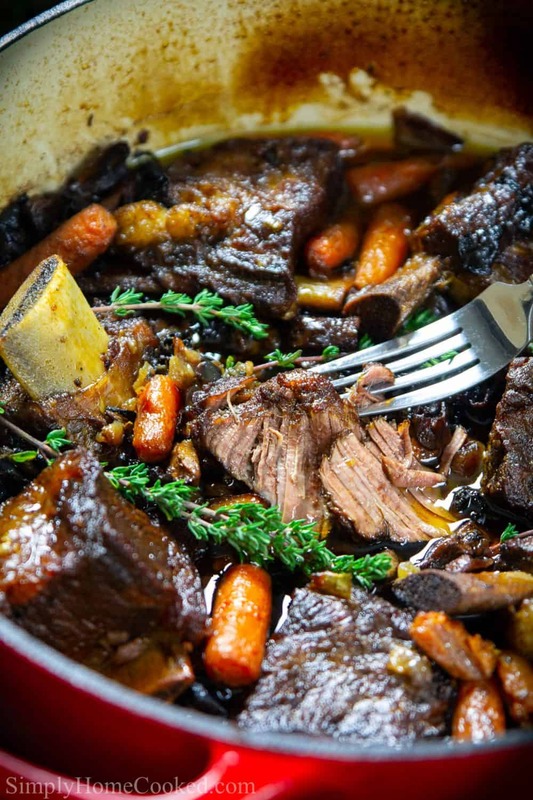 Dina, when I saw your video recipe for these braised beef short ribs, my mouth watered. Tender ribs that fall off bone are the best! Thank you, Natasha! We are over the moon for these short ribs! So easy and so tasty! 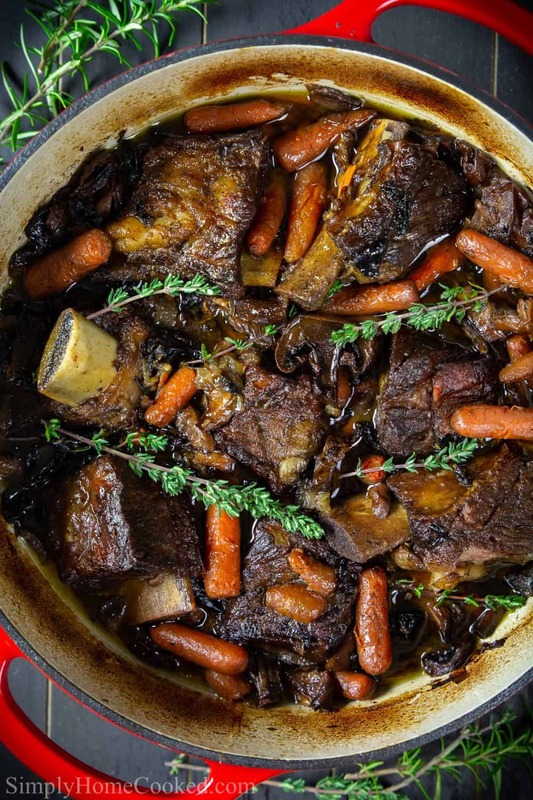 These braised beef ribs look amazing Dina! I love how you can take simple ingredients and transform them into something absolutely amazing. Love it!!! I will try this Monday!! Thank you Truc, I hope you love the braised beef recipe!